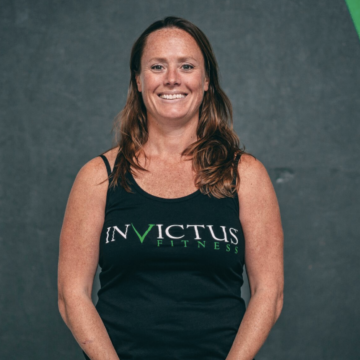 Michele is the Content Editor for Invictus Fitness but has worn many hats over the years and is one of the company’s original coaches. She has been in the coaching field since 2007, and has worked with all types of individuals in that time. That coaching experience, along with her background in journalism and writing, allows her to produce timely and interesting health and fitness articles as well as help other members of the staff share their knowledge through the company’s world renowned blog. Michele is a lifelong learner and holds a number of coaching certifications from a variety of disciplines (both inside and outside of CrossFit) in the health, nutrition, fitness and professional coaching worlds. Her coaching is currently focused on the gym’s Burn 30 Class – a program she created for busy professionals who want to get in a quick, effective and safe workout over their lunch breaks – and Larry the Legend, the gym’s first – and oldest – member who is now in his 80’s. In her free time, Michele loves to travel, cook and read. She played a variety of sports growing up and is a former collegiate soccer player, was a nationally ranked competitive swimmer, and has competed as both an individual (2008, 2009) and on the Invictus team (2010) at the CrossFit Games. Michele earned a B.A. in Sociology from California State University, San Marcos, focusing on the study of foodways – the cultural, social, and economic practices relating to the production and consumption of food. At the same time she started coaching, she also started M Good Meals, a Zone, then Paleo-friendly catering service; and traveled Southern California to provide cooking and meal prep seminars. In 2012, she authored a cookbook – Roaming the Globe-Practical Paleo for Busy People – which shares not only recipes and cooking tips, but also stories of her life and how the recipes came to be. Before pursuing a career in health and fitness, Michele spent five years as a Marketing & Development Officer for a non-profit agency.